Spoiler Alert: This post discusses events in Call the Midwife Season 7 Episodes 1 and 2. Season 7 of Call the Midwife is finally here! 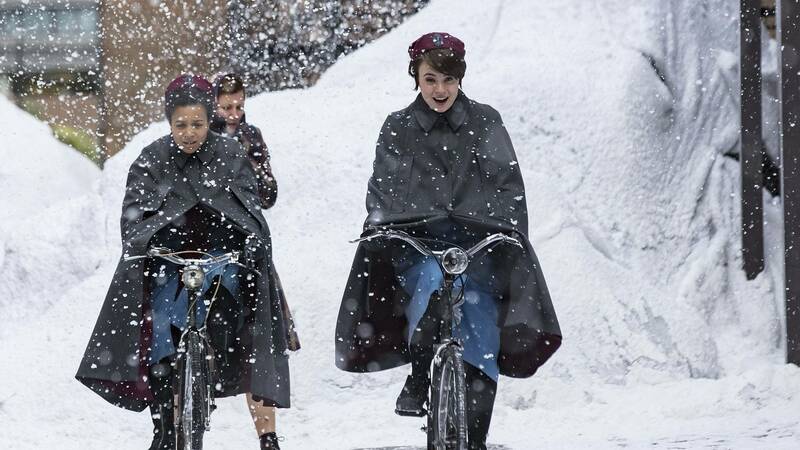 I settled in and re-watched the Christmas episode last week to get myself in the mindset for a new season, and of course, Call the Midwife did not disappoint! I’m thrilled to be transported each week back to Nonnatus house, surrounded by characters that feel like friends. In our first episode, we meet the new midwife, Nurse Lucille Anderson. How exciting to have a midwife from Jamaica all the way in Poplar! I could tell by her first birth attended with Trixie that Nurse Anderson was a perfect fit with the midwives of Nonnatus house. She stayed calm and collected in the face of a complicated breech birth, and helped Trixie through a very harrowing moment. I can’t wait to learn more about Lucille as the season goes on! In episode 1, we meet Nadine Mulvaney, a stripper who we quickly realize has been trying to hide her pregnancy. Nadine’s boss confronts her about the pregnancy and tells her that she can’t work anymore. The part that really broke my heart was the swift judgment from her boss and the statement that Nadine would never have a respectable job; she should “get rid” of the child and get back to work. We next see Nadine at her first appointment with the midwife. The part I loved about this scene is the kind, welcoming, inclusive attitude she received at that first visit. It is so important with every client that we meet, whether pregnant or not, to welcome them into our care without judgment. Taking time to listen to their story, validate them, and provide the same level of comprehensive and sensitive care no matter what their background might be is an important part of not only midwifery, but all health care. We learned that Nadine is Rhesus negative, also known as Rh negative. She is told that this is not a problem for first pregnancies, and she confirms that it’s her first baby. We now take precautions with anyone who is Rh negative, and provide an injection of a medication called Rhogam around the 28th week of pregnancy. This prevents antibodies from forming that could potentially view a baby who is Rh positive as a foreign invader, causing the mother’s immune system to attack the blood cells of her baby. Rhogam was not approved and given routinely until 1968. During Nadine’s birth, I loved the calm atmosphere of support that Trixie was providing. One-on-one labor support, such as from a midwife or doula (trained childbirth support person), is shown to reduce stress and anxiety, decrease the length of labor, decrease the woman’s desire for pain medication or epidural, and decrease the chance of needing a cesarean section (Hodnett et al., 2003). For a woman such as Nadine, who did not have any family, friends, or partner support during her pregnancy or labor, this continuous labor support was vital. When Trixie realized that Nadine’s baby was breech, or coming out bottom-first, she immediately called for a second midwife. As much as the Lucille arrived for safety reasons and to assist with any complications, having the second midwife there for support was also invaluable for Nadine. I see continuous labor support from nurses, doulas, and midwives make such a difference in labors. I know with my second baby, who was born in July of last year, I don’t feel like I could have gotten through it without my doula and midwife. I felt like they believed in me and my ability to birth a baby without pain medication more that I believed in myself! I remember so early in the morning, being in the shower, recognizing that this was still early labor, but the contractions were hard. I remember thinking to myself maybe I’m just not cut out for unmedicated childbirth. (Side note, I had an epidural with my first baby. I’m so thankful for it, because it was what I needed for that labor, but I really wanted to try without it this time!). However, once my doula and my best friend, who also happened to be my midwife, arrived to my house, the amazing support and encouragement gave me a renewed sense of confidence and peace during my labor. I’m sure they stepped out to use the bathroom or eat, but I felt like someone was always right there with me. My husband got our older son off to his grandparents’ house and joined us as well, never leaving my side for more than a moment. When I felt like it was time to go to the hospital, my doula even rode in our car with me to support me during the contractions I had on the short drive in. Finally, in the last minutes of transition, when I truly felt like there was no way I could go on, my birth team encouraged me to hang in there just a few minutes more, and sure enough, we welcomed our second son, Theo, into our family after a long, but beautiful, unmedicated birth. This past week treated us well with TWO new episodes of Call the Midwife to enjoy! I loved that the second episode showed us more about Lucille’s personality. When she is faced with serious prejudice from a patient’s mother, she remains calm and strong, and does not let it impact the care that she is providing. There can be many times that situations might make us uncomfortable as healthcare providers, whether it is a family member disliking us or an unexpected outcome (or in Lucille’s case, both), but Lucille stood by the quality of care that she provided for her patient and respectfully found a way to work with this patient’s family. There are so many things to continue to look forward to in season 7: Trixie’s romance, learning more about newer midwives Valerie and Lucille, how Shelagh will manage with her new au pair, and of course, keeping up with the Sisters of Nonnatus house! After the first two captivating episodes, I can’t wait to see what else this season will bring.